Mississippi Grind, the latest from Ryan Fleck and Anna Boden (Half Nelson, Sugar), is getting a lot of props for the way it evokes the rhythms and naturalism of the best films of the storied ‘70s. And it does—and should, since it borrows so liberally from Robert Altman’s 1974 drama California Split, another tale of degenerate gamblers meeting over cards and forming a fast friendship. 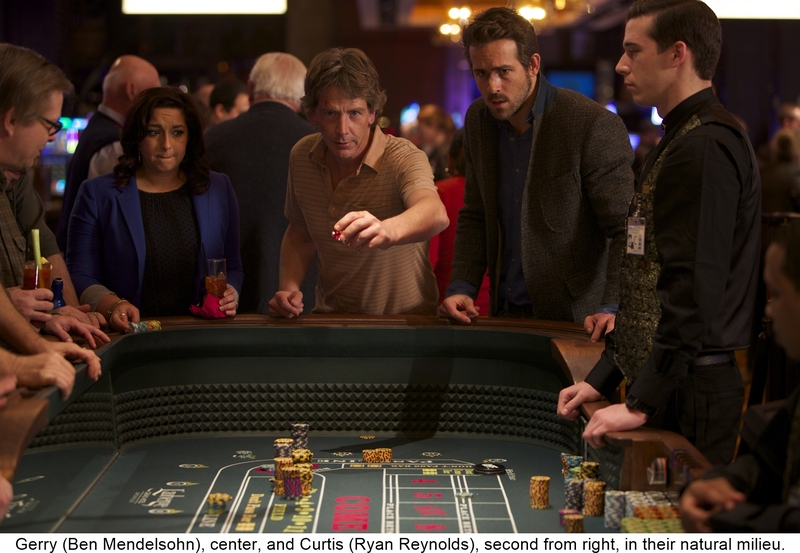 That doesn’t take anything away from Mississippi Grind, which is a sharp character study and a gift to stars Ben Mendelsohn and Ryan Reynolds, but let’s give credit where credit is due. The characters played by George Segal and Elliott Gould in Altman’s film were more up-market and could afford their addictions—at least, up to a point. The same cannot be said for Gerry (Mendelsohn), a down-at-the-heels real estate agent, and Curtis (Ryan Reynolds), a well-heeled drifter whose habit of ordering top-shelf bourbon masks a threadbare life. When they meet over a poker game in a Dubuque, Iowa bar—Gerry lives in the town, Curtis is just passing through—it seems like fate. Gerry, who is as addicted to a CD lecture on the subject of “tells” as he is to gambling, sees it as a sign that both of them are the only ones at the table who noticed a rainbow the day before. Subsequent events only confirm a cosmic connection between them in his mind and he begins to see handsome, strapping Curtis—who towers over his own diminutive self—as his personal lucky leprechaun. The pot of gold at the end of their personal rainbow is a card game in New Orleans with a $25,000 buy-in. Not that they have the money, but they figure they can earn it gambling their way down south in a road trip built on sheer bravado. There is nothing that happens on Gerry and Curtis’s journey that could not be predicted. They are, after all, compulsive gamblers. Their greatest skill is in in self-delusion, but they are no slouches when it comes to lying or stealing to further their agendas. Gerry is the needier of the two, desperate to get out from under the mess he’s made of his life and buying into Curtis’s elaborate stories. These guys don’t just have a lot of baggage. They have great big steamer trunks of past mistakes, present disasters, and future cataclysms strapped to their backs, but despite that—or maybe because of it—genuine feelings form between them. One of the great joys of Mississippi Grind is watching that relationship unfold even in moments when one or the other seems intent on screwing the other over. Aussie actor Mendelsohn (Animal Kingdom, The Place Beyond the Pines) and Reynolds, in his meatiest role since 2007’s The Nines, are terrific as two beautiful losers who’ve always been willing to wager on anything, now betting—for a while, at least—on each other.